Where did Relative B get her copy from? She lived in America, sent the photocopy in 2001, and marked other documents with reference file numbers, but omitted such a reference from this copy. The reference numbers have since been identified as the file numbers for Family History Library (FHL) microfilms. So her most likely source is a FHL microfilm. 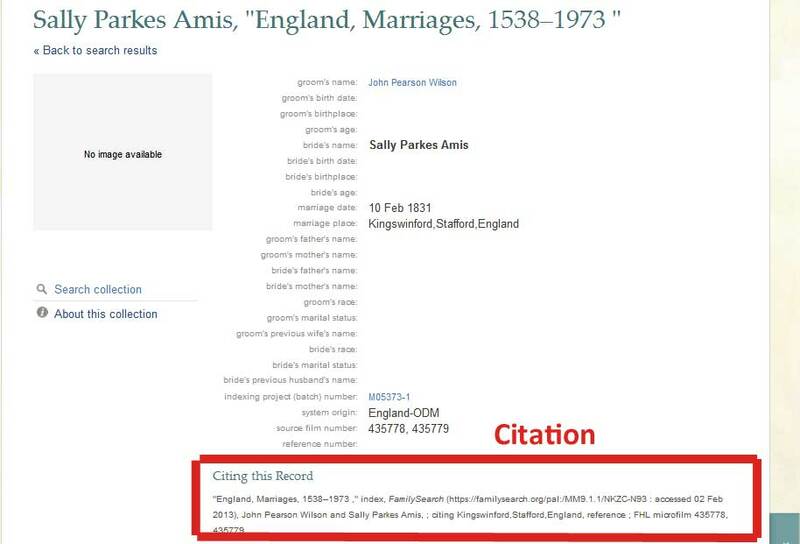 “England, Marriages, 1538–1973 ,” index, FamilySearch (https://familysearch.org/pal:/MM9.1.1/NKZC-N93 : accessed 30 Jan 2013), John Pearson Wilson and Sally Parkes Amis, ; citing Kingswinford,Stafford,England, reference ; FHL microfilm 435778, 435779. The BMSGH CD, published in 2006, and the Peers book, also published by BMSGH on microfiche in 2002, are transcripts published too late to be Relative B’s source. So, that leaves the marriage register and bishop’s transcript microfilms. Notice that the index citation gives the film number 435778, the Bishop’s Transcript number. I can’t be sure of Relative B’s search strategy, but it is more likely that she used the index to access the Bishop’s Transcript than browsed the Marriage Register page by page. Where are the Original Records? According to the FamilySearch catalogue, the Bishop’s Transcript was filmed from “original records in the Gloucester City Library, England”, and the film containing the Marriage Register (and a disparate collection of other records) derives from “originals at the Central Library, Dudley, Worcester and at the Staffordshire County Record Office”. The first location sounds odd as Gloucester is not in the same county and I expect Bishop’s Transcripts to reside in County or Ecclesiastical archives. The second is not specific to the marriage register, leaving me none the wiser which repository actually holds the register. As Kingswinford is in the county of Staffordshire, the Staffordshire Record Office is a likely repository. Their helpful Guides to Sources includes a downloadable list of the locations of Staffordshire Parish Registers and Bishop’s Transcripts. Original Kingswinford Parish Registers are at Dudley Archives, microfiche parish registers are at Staffordshire Record Office and Bishop’s Transcripts are at Lichfield Record Office, the official repository for the Diocese of Lichfield. How do I cite my sources for the marriage of Sally and John? I have two sources, the photocopy from Relative B and the index entry. The index entry citation provided by FamilySearch gives sufficient information to retrieve it, but is incomplete as it lacks useful indication of its derivation. You have to go and look up the file number to find out. In August 2012, The Ancestry Insider commented in FamilySearch Citation Report Card, that citations for collections that contain from multiple archives still need considerable work making the file number links automatically to create complete, genealogically sound citations. “England, Marriages, 1538–1973 ,” database, FamilySearch (https://familysearch.org/pal:/MM9.1.1/NKZC-N93 : accessed 30 Jan 2013), entry for John Pearson Wilson and Sally Parkes Amis; citing microfilm 435778, Family History Library, Salt Lake City; citing Church of England, Kingswinford Parish (Staffordshire, England), Bishop’s transcripts, 1666-1857. The photocopy citation is more tricky, because I am not certain if it is a copy of the Bishop’s Transcript or Parish Register. How would you cite it?